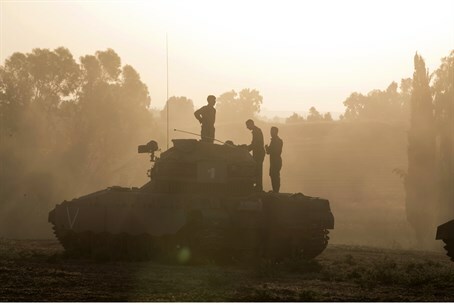 Senior IDF source tells Arutz Sheva a ground invasion is all but inevitable as a result of Hamas's callous use of human shields. A senior IDF official has told Arutz Sheva that the army has no choice but to launch a ground offensive into Gaza in order to stamp out rocket fire on Israeli civilians, because Hamas and other terrorist groups have embedded their military infrastructure so deeply into the civilian population that it is impossible to reach via air power without causing massive collateral damage. In particular, the source said Hamas has hidden its missile stockpiles and even embedded launchpads specifically in schools and hospitals - callously using the most vulnerable members of society as human shields. At the same time, the Islamist group is not allowing civilians to leave the area; on the contrary, it is encouraging as many noncombatants as possible to "protect" its positions with their bodies. As a result, he said, a ground invasion is all but inevitable. Earlier Thursday, it was revealed that Hamas had told Gazans not to listen to IDF warnings of impending strikes, but to stay indoors and act as human shields. The Israeli Air Force has used numerous methods - from phone calls and leaflets, to firing dud missiles before a strike (known as "knocking on the roof") - to warn noncombatants prior to military strikes in their vicinity. But the Hamas-run Gaza Interior Ministry said in a message to residents that the warnings "are designed to weaken our resolve and to sow panic and fear among us, in light of the failures of our enemies. We call on Gaza residents not to pay attention to these messages and not to leave their homes." In previous operations, IDF footage and photos have shown how Palestinian terrorists hide weapons and munitions in mosques, schools and other sensitive civilian sites, in direct contravention of international law. Some Israeli leaders have referred to this practice as a "double war-crime": firing missiles indiscriminately at Israeli civilians, while using Palestinian Arab civilians as human shields. During the current escalation Hamas has openly boasted about the "success" of this strategy, and the IDF has published extensive evidence of the practice. Earlier Thursday, Economics Minister Naftali Bennett said Hamas was directly responsible for any civilian casualties in Gaza due to its "cowardly" tactics. "Hamas has missile-launchers hidden in homes and in schools," he said. "I myself was a commando fighter in Gaza and I saw missile-launchers in the living room of a home. When you do this you are killing your own children. Hamas is clearly responsible for the very unfortunate death of Arab citizens." 82 Gazans have been killed since Operation Protective Edge began three days ago - 30 of them on Thursday - according to Gaza medical sources. Those figures have not been independently verified, but the majority are believed to be terrorists from Hamas and Islamic Jihad, killed in precision IAF strikes. Some, however, are civilians - and many of them were killed while heeding Hamas's calls to protect terrorist infrastructure with their bodies. The tactic is win-win as far as Hamas is concerned. In most cases, it knows that Israel will simply refrain from taking action if Israeli forces are aware of the presence of civilians in the vicinity; but when IDF forces are unaware of the presence of human shields - as occurred in a tragic episode on Tuesday - Hamas can score a propaganda victory by presenting civilian deaths as "proof" that Israel is killing Palestinian civilians. The only way to thoroughly root-out the rocket launchers and terrorist infrastructure without risking heavy civilians casualties is therefore to face Hamas in the streets and allies of Gaza City, Rafiah and other urban areas where they are based. And, as Middle East expert and Arutz Sheva contributor Dr. Mordechai Kedar pointed out in a recent article, that may be precisely what Hamas is trying to achieve. Indeed Israel has managed to avoid serious casualties until now by relying on its extensive defensive measures - from a comprehensive network of bomb shelters to the Iron Dome missile defense system. A ground incursion, however, is likely to be much more costly. Bearing that cost in mind, if - as looks all but inevitable at this point - the IDF does indeed embark on such a mission, the only acceptable outcome will be a route of Hamas and its allies, and a complete end to the rocket fire.